Vitamin B12 is a water soluble vitamin which is important for the body to make red blood cells, nerves, DNA and other functions. It is not synthesised by the body and thus Vitamin B12 rich foods should be included in the diet. Vitamin B12 deficiency can be caused in cases if vitamin B12 is not absorbed from the food properly, pernicious anemia, improper absorption due to post surgical treatment and insufficient intake of Vitamin B12 in the diet. To treat Vitamin B12 deficiency, Vitamin B12 rich foods in the diet can be included such as fish, red meat, eggs, milk and milk products, legumes, nuts, seeds and soy products. The chances of Vitamin B12 are high in vegetarians as vegetarian foods do not provide complete recovery from the Vitamin B12 deficiency. It can also be taken in form of oral supplements. Vitamin B12 injections are also available in the form of cyanocobalamin which can be administered parenterally or via intramuscular route. In case, the cause of deficiency of Vitamin B12 is pernicious anemia, parenteral administration of Vitamin B12 is preferred. Vitamin B12 is also available in the form of gel which can be applied intranasally, which is an alternative to Vitamin B12 injections. Vitamin B12 deficiency should not be ignored as severe deficiency can lead to blood diseases and neurologic problems. High levels of Vitamin B12 may be seen in kidney failure, diabetes, liver disease etc. 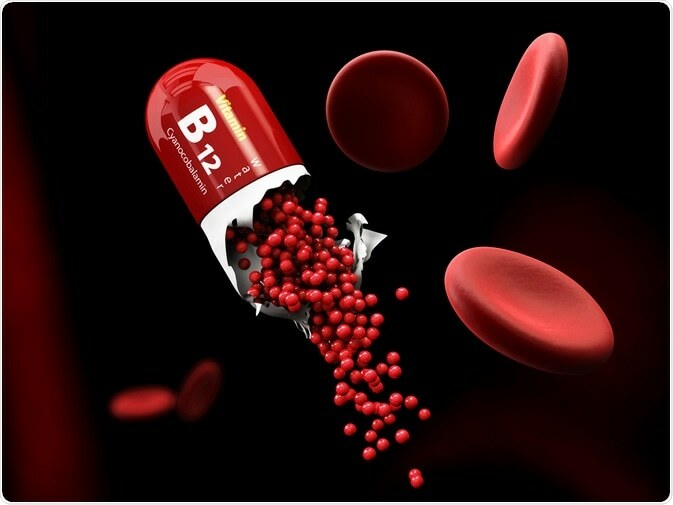 Low levels of Vitamin B12 may be seen in anemia, hyperthyroidism (high levels of thyroid), worm infection etc.